Mini 1903 Teddy Bear by Steiff. 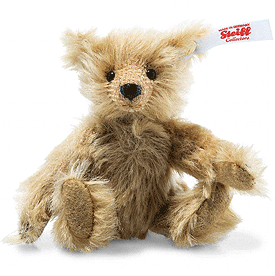 A beautiful limited edition Steiff item, made by hand in cinnamon mohair. He is one of those delights that you would just love to discover all over again – to lay eyes on him and stroke his fur ... With his endearingly shaggy appearance and friendly button eyes, the cinnamoncoloured Mini Teddy bear is an homage to the early days of Teddy bears. His hand-stitched and gleaming lacquered nose call to mind the time when Steiff noses were generally made of sealing wax. Each paw has five claws stitched by hand, just like in the early years.